Like the first sip of a tiki drink. Like jumping into Lake Michigan on a hot day. Like peeling off a wet sports bra. I should know better than to sew a dress the day of a party. You could write a mathematical proof showing that impulse sewing directly increases your level of stress. But sometimes (who am I kidding, A LOT of the time) your fabric speaks to you. You have a serger now it says. I’m a thick, sturdy knit it says. You’ve already sewn this pattern twice it says. And so I listened. I listened and that meant I was sewing on a neckband and finishing sleeves and the hem barely 90 minutes before folks walked through the door for my birthday party. Choose a fast sewing method. Sorry French seams and Hong Kong finishes! We’ll meet again some leisurely day. I used my SUPER FAST WONDERFUL serger for most of the construction of this dress and used the sewing machine to anchor the neckband and sew the hems. Don’t rush the finishing touches. 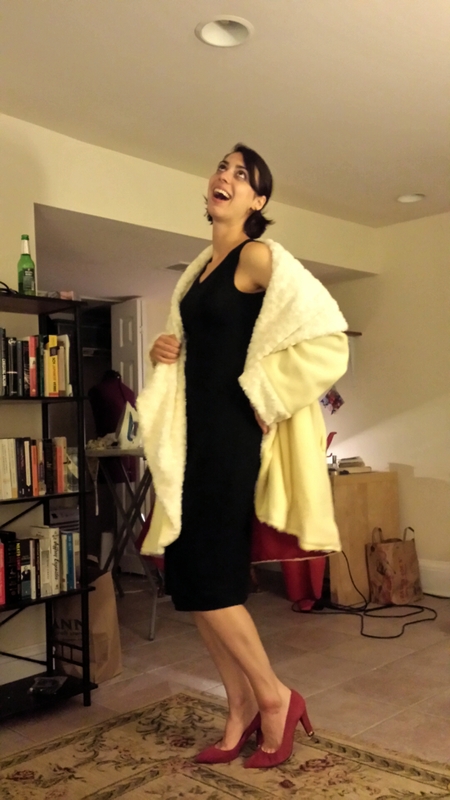 Listen, I know that my hems look better when I use a walking foot. I know it. But I let my pre-hosting jitters cloud my brain into 1). using a regular foot and 2). not busting out the twin needle. I used a ballpoint needle (I’m not INSANE, y’alls) and a zigzag stitch, and my bottom hem turned out a wee bit wavy for my liking. Note to self: Take the extra 3 minutes to attach the walking foot and thread the twin needle. Le sigh. Do you have any tips for speedy sewing? I’m all ears. And happy SPRING everybody! I’m embracing it with plenty of pretty florals and rosé wine. Actually, I drank rosé most of the winter, too. The gods of booze snobbery will have to pry my rosé out of my cold, dead hands. One of the benefits of moving is finding buried treasure. Nobody in their right mind enjoys the laborious process of packing, cleaning, and carting boxes, so I’ll take a silver lining wherever I can get one. This time around—my fifth Chicago apartment in three years—I stumbled across a few forgotten gems. In the bottom what I like to call my Second Hamper, the contents of which hadn’t been laundered in probably 10 months, I found this Madewell Indigo Ink Sweatshirt that I’d scored on super sale a couple years ago. Chaching! It was like shopping in my own (dirty) closet. When it came time to pack up my sewing supplies, I discovered a few cheap-o patterns I’d bought during one of JoAnn’s pattern sales when I first started sewing. At first glance, these patterns seemed pretty dull: a boring tote, some simple A-line dresses—nothing to write home about. 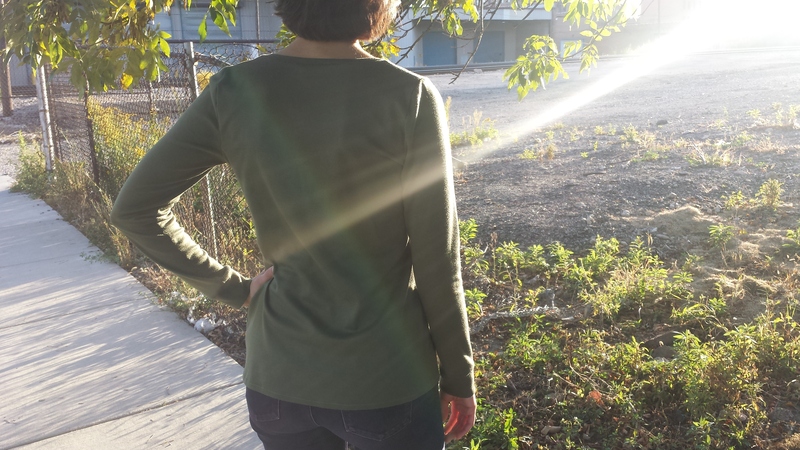 And then I found McCall’s M6654, an easy-level pattern designed for knits. McCall’s obv. needs to work on its styling….. I know, it looks kind of boring. But I’ve been looking to add another skirt to my winter wardrobe, and this run-of-the-mill piece fit the bill just fine. The pattern offers semi-fitted and loose-fitting elastic-waist skirts in seven lengths, from mini to maxi. I went with the semi-fitted view and cut out a size 14 (28″ waist; 38″ hip) at length B. Luckily, I had everything I needed already in my stash: just enough french terry leftover from Marc’s Strathcona tee, and some leftover 2″ elastic from my Hudson pants, substituted for the 1″ elastic called for in the pattern. This was one of the easier projects I’ve sewn in awhile, and that’s saying something since I’ve been whipping up relatively easy garments all year. 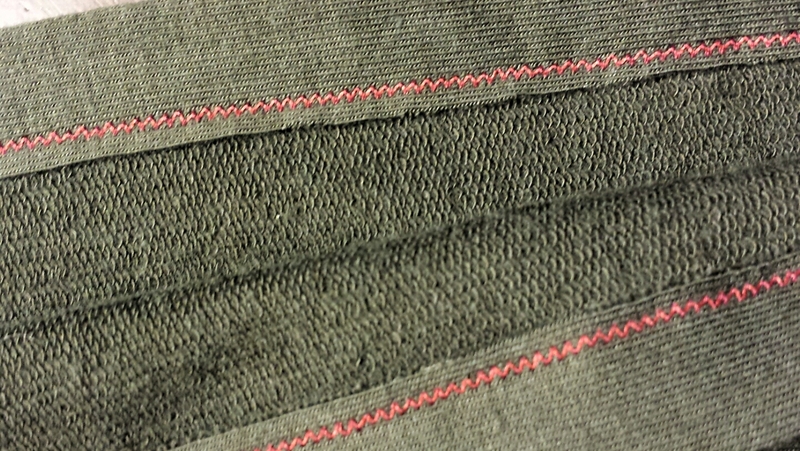 I used a ballpoint needle coupled with a stretch stitch for the seams and a twin needle for the hem. The fabric is pooling a bit under the waistband, which means I probably could’ve gone one size smaller, especially considering the decent amount of stretch in my fabric. That said, the skirt was incredibly comfortable even after furniture shopping all day, including a multi-hour IKEA trip. 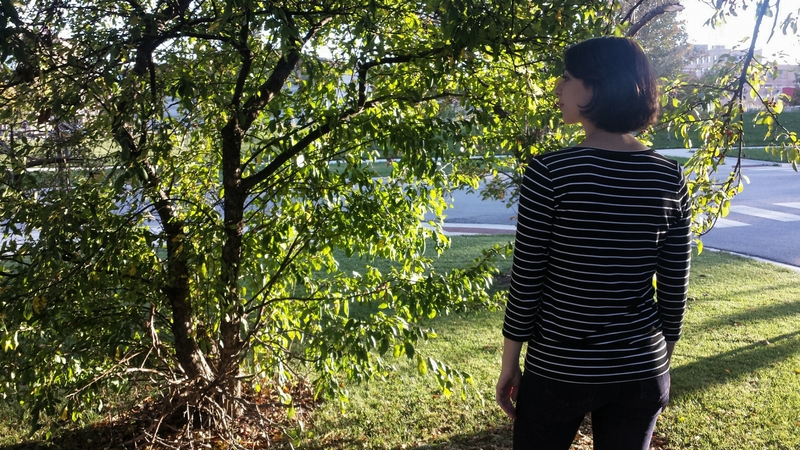 Since I sometimes have trouble deciding how to wear a simple knit skirt, I figured it might be helpful to show two different ways to style one. The majority of the time, I’ll be dressing this skirt down, as I work in a very laid-back office and generally dress for comfort. 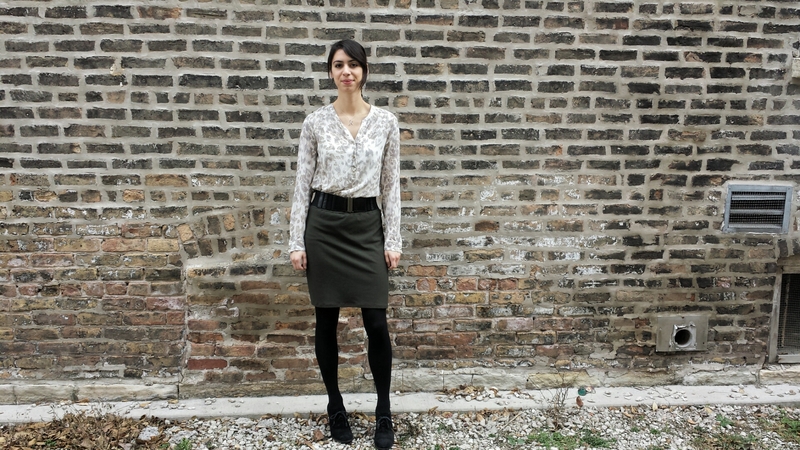 Here, I paired the skirt with a tent-style long-sleeve top from Una Mae’s in Chicago. It’s got an interesting, flowing shape that skims the body and doesn’t compete with the semi-fitted cut of the skirt. Add some tights (a colorful pair would be cute) and a pair of casual boots, and this’ll take me anywhere from weekend shopping to the office to a dive bar. Look #2 skews dressier. 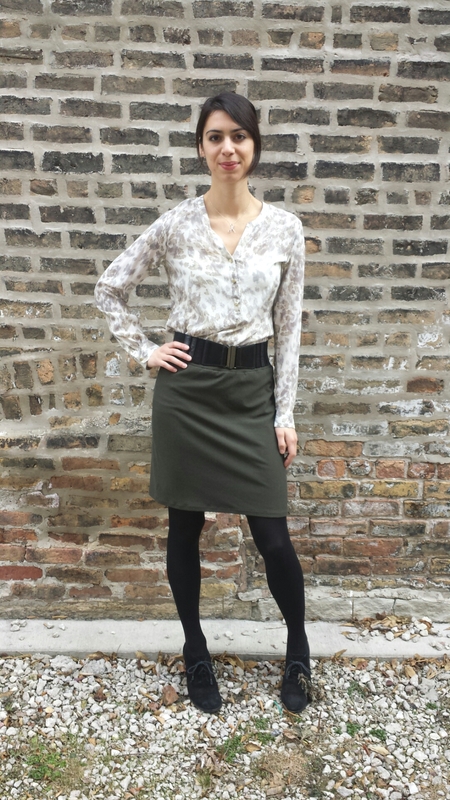 The elastic-waist design makes this skirt a good candidate to pair with an airy blouse. I tucked in a semi-sheer printed blouse and threw on a wide elastic belt for a little extra polish. Simple black tights and monochromatic suede booties with a chunky heel complete the outfit. I could see wearing this to work in a business casual environment, or out to a restaurant with two or more dollar $igns on Yelp. 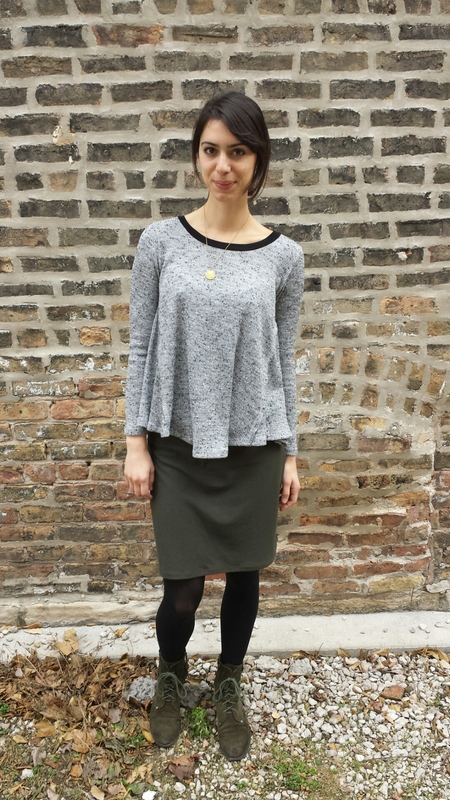 How do you style a knit skirt? 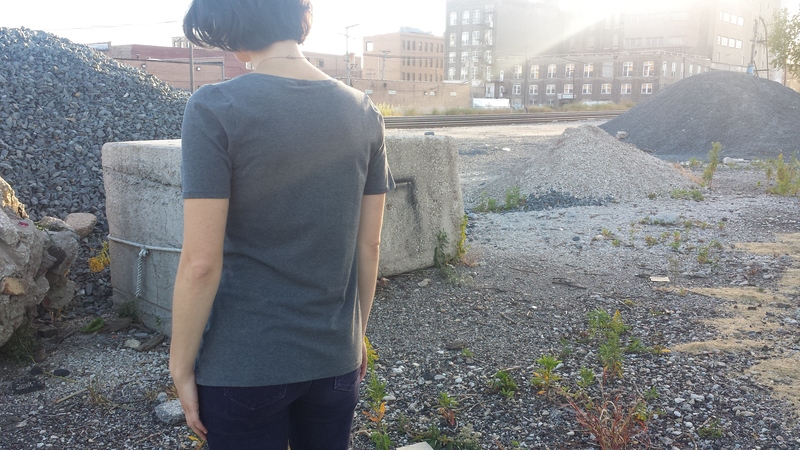 I haven’t had time to take proper photos of a couple items I’ve recently sewn (men’s Strathcona T-shirt and a super-easy knit skirt), so I wanted to share a few detail images of my favorite new finishing/hem technique: the twin-needle stitch! 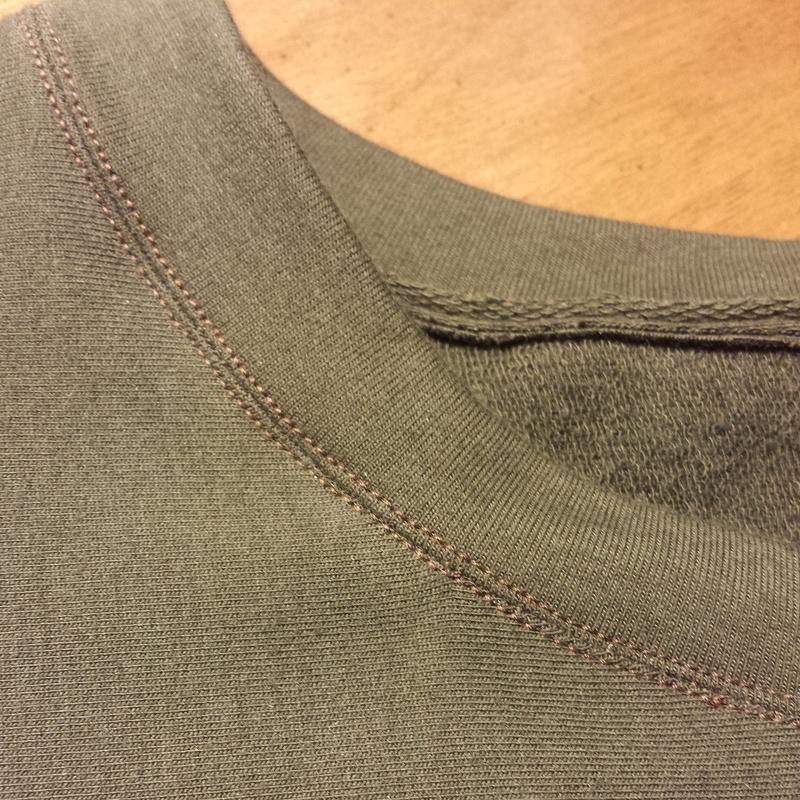 Here, a twin stitch is used on the neckband of a nearly finished Strathcona tee for Marc. Here’s the opposite side of the hem of a knit skirt. Why was I so terrified of using twin needles for so long?! It turns out they’re just as easy to use as a regular needle (just takes an extra second the thread), and they provide knit garments with a hem that looks less homespun and more RTW professional. I’m excited to have this simple finish in my small but growing bag of tricks. How do you use twin needles? Any tips? 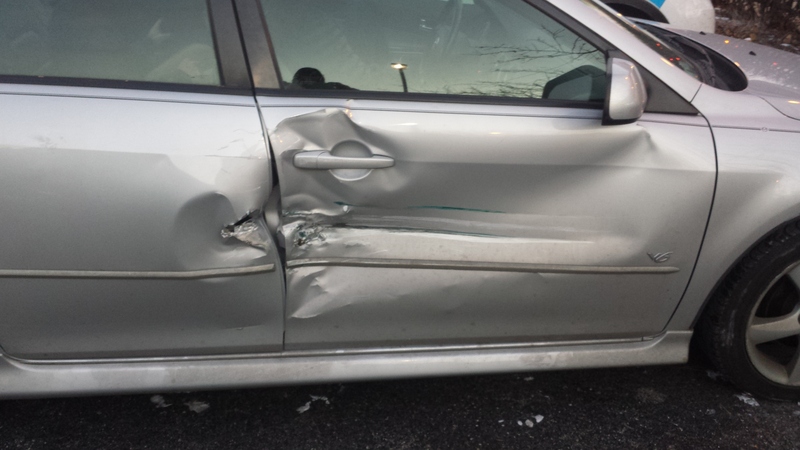 This year, I’m thankful for my friends, family, and that we got out of that little accident completely unscathed. Happy Thanksgiving! I tend to gravitate toward prints. There’s something about sewing with a colorful floral, geometric print, or even an ugly-sweater knit that makes me feel happy. Plus, if I’m going to invest planning, labor, and money into an article of clothing, I want it to be more vibrant than something I can buy off the rack. The one-of-a-kind factor is part of what makes this hobby so gratifying. 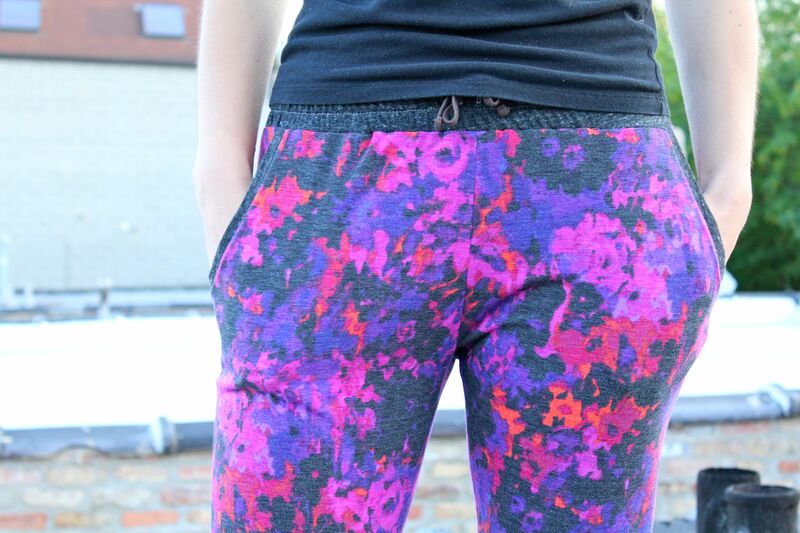 Unfortunately, this obsession with bold prints means that I haven’t sewed many everyday wardrobe staples. I’m a creature of habit, and this summer the habit has been wearing the same store-bought chambray skirt roughly twice a week. It’s comfy, it goes with nearly everything in my wardrobe, and it’s weighty enough to stand up against the ridiculous Chicago wind. But I’ve put the poor thing through the ringer, so I figured it was high time to add another versatile skirt to my wardrobe. I’ve already gone the bold-print quarter-circle skirt route, so this time I went for a half-circle in a black ponte knit from JoAnn. I used the trusty By Hand London app again for the waist radius and length measurements, but since I was working with a knit I also heeded iCandy’s tips about subtracting 2″ from the waist measurement before plugging it into the app. 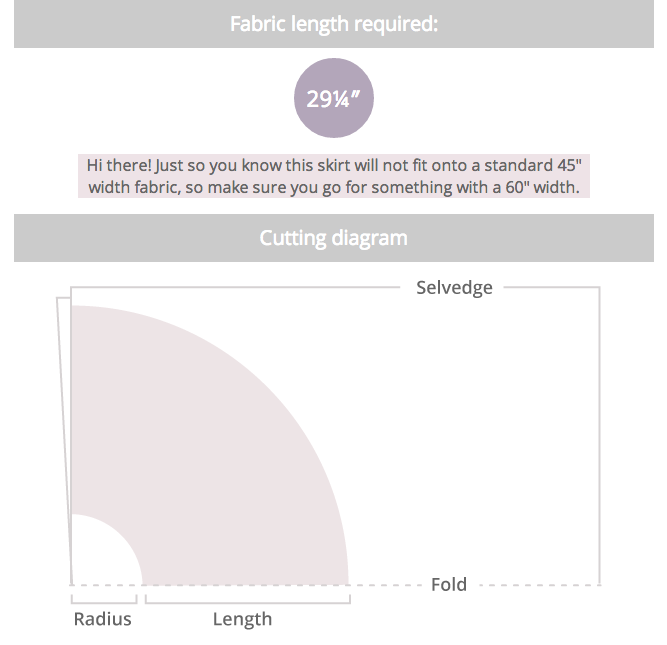 Keep in mind that the app adds in 5/8″ seam allowances. I used a homemade twine compass to trace the waist radius and length, although that part was tricky since my tracing pencil kept dragging the knit fabric along with it. I ended up marking a series of dashes that I followed with my rotary cutter. Note to self: buy marking chalk! That’d probably be more friendly on a knit, right? 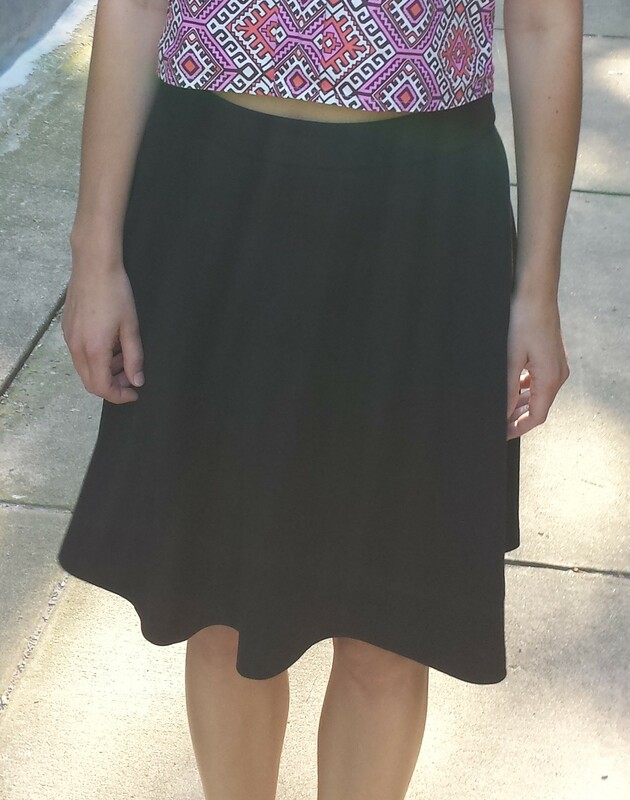 The step-by-step construction of this skirt is amazingly easy. I don’t have a serger, so I attached my machine’s walking foot, inserted a ballpoint needle, and used a zigzag stitch for the seams. After stitching the back seam, I attached the waistband per the directions of the straightforward iCandy tutorial. After clipping the excess seam allowance and ironing the waistband, I hemmed the bottom of the skirt with a roughly 1″ hem. 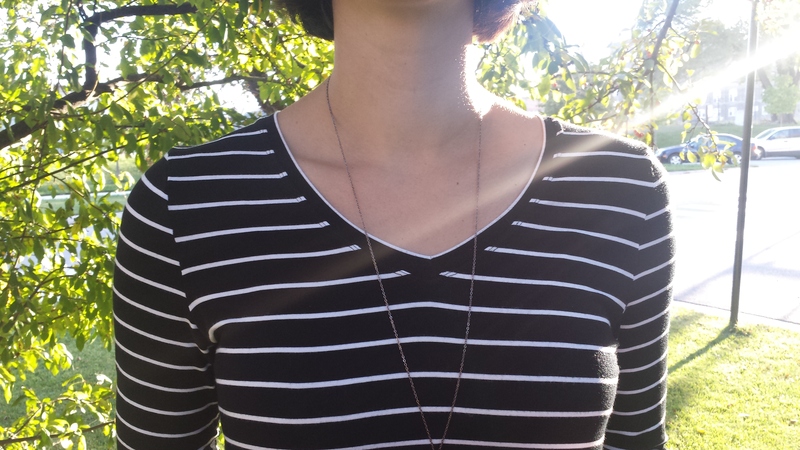 This isn’t technically required since it’s a knit and won’t fray, but I like a clean finish. And that’s about it! 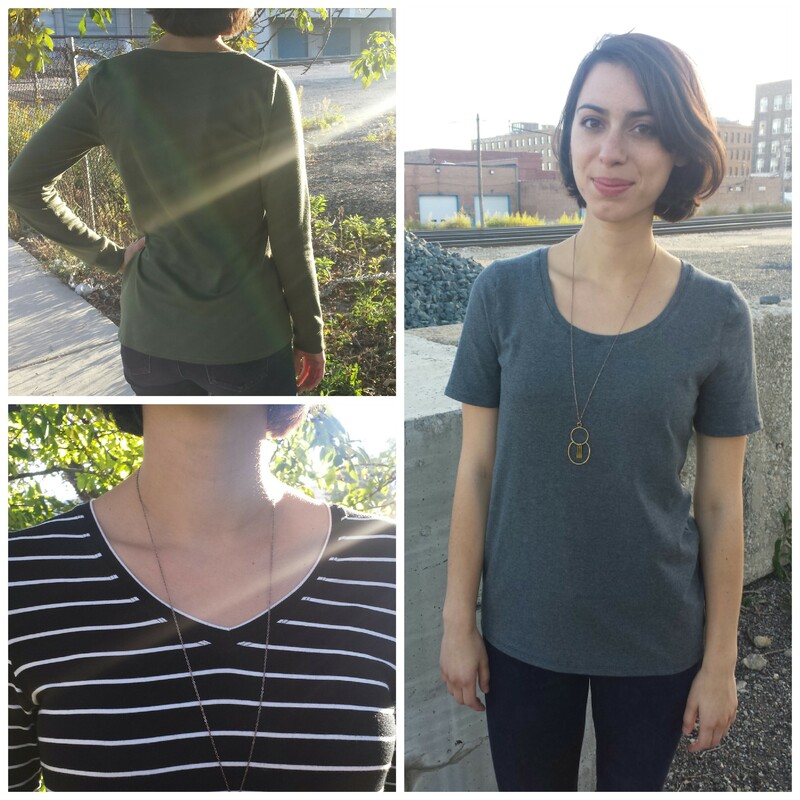 It’s really a sewing 101 project, and an especially good one if you’re looking to break into the world of knits. I didn’t add a zipper since the material is stretchy enough to get on and off (gently) over my head, but I might try another version with a short zipper and see which is more comfortable. I’m a little afraid this material will stretch out over time, but it wouldn’t be the end of the world since that would just mean the skirt would sit a little lower. It’s not an earth-shattering make, but it’s comfy, it fits great, and it cost under $7 total. 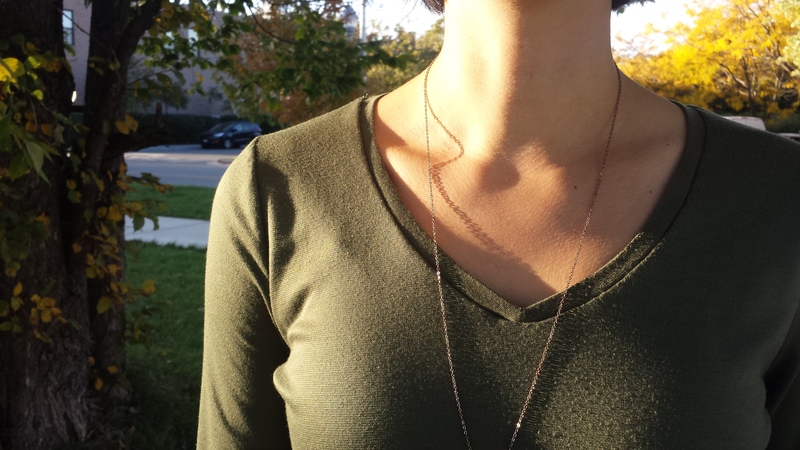 Not too shabby for a new wardrobe staple. 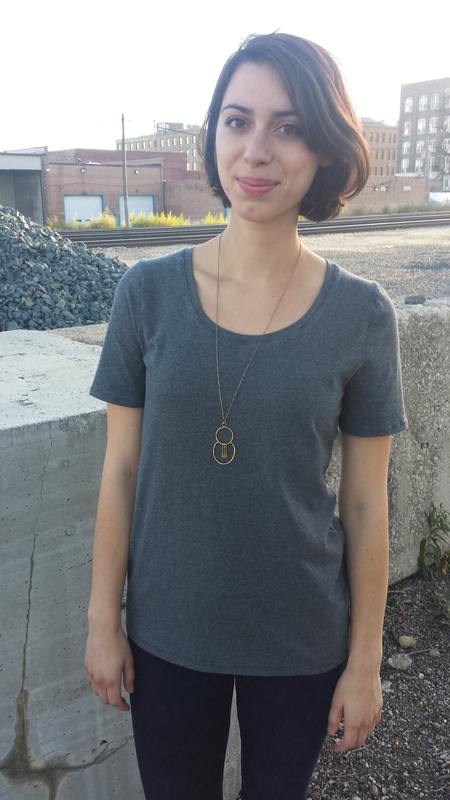 I’ve already paired it with my Colette Sorbetto crop top (pictured) and a tucked-in tee, and both are comfy. 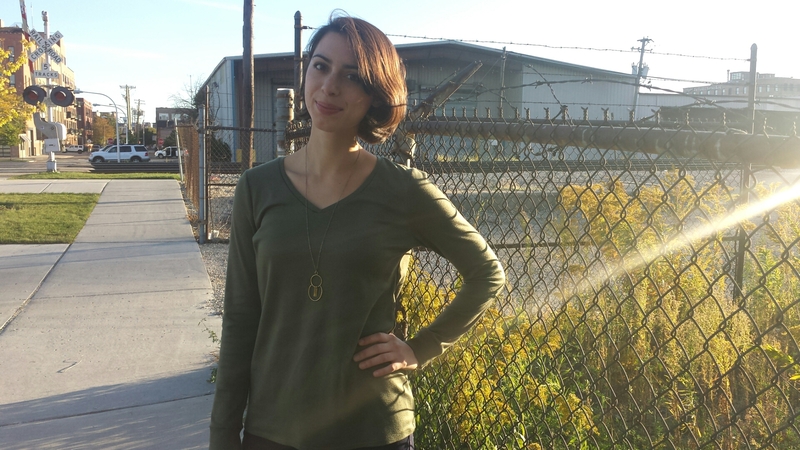 What’s your most versatile piece of self-made clothing?